"Self-rooted, a Pinot Noir vine is Pinot Noir from root to tip to shoot tip." The Okanagan, despite its famous Summer heat, can still see winter temperatures that may damage or kill vines. For this reason the majority of our vines are self-rooted plants that have proven hardy and tend to be less susceptible than grafted plants to winter kill as well as certain diseases. 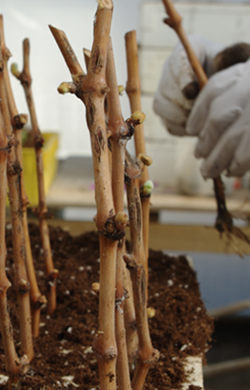 Self-rooted plants are different from many vines seen in BC, in that they are grown from cuttings (from older vines) that sprout roots and leaves when propagated. We have grown nearly every one of our plants from cuttings to mature vines, something that few other wineries have in common. This way, we can select our cuttings from proven hardy, healthy vines that have adapted to the Okanagan climate, and can ensure the quality of the plants from first budding onwards. For this reason we have a unique understanding and attachment to our vines, some of which were started decades ago. Watching each phase has provided us with intimate knowledge of how each plant grows and adapts in the Vineyard. In growing grapes, we must consider the plant's point of view - if it's happy it will perform optimally. After many years of growing vines, Lanny believes that every intervention in the vineyard's living system increases the odds of a response that is not always desireable. For this reason, we avoid using drastic measures, be they intense spray programs, excessive cropping/crop dropping, or severe deficit irrigation. We like to think that we are helping the vine along its way, not telling it which way to grow. The best fruit is produced by well balanced plants.